I am a Senior in high school now, and presently, it has been cushy. Excluding AP Statistics, of course. I really regret signing up for that course. 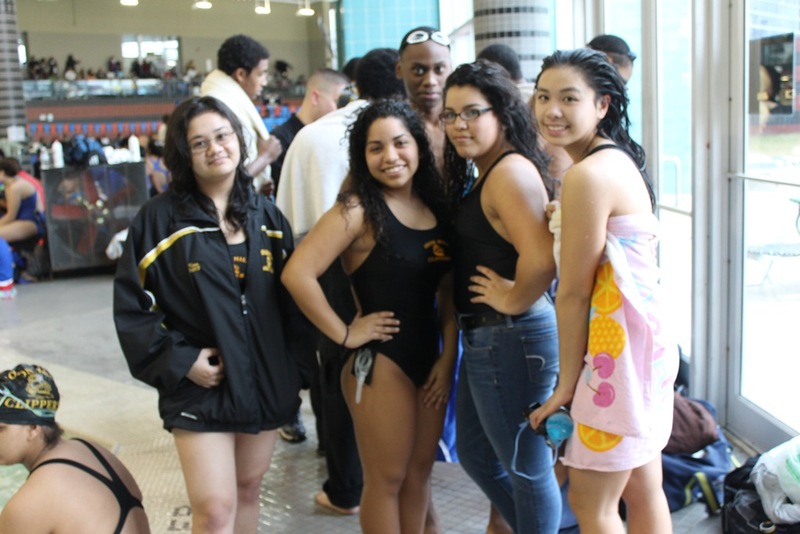 Recently, as in FRIDAY, there was an announcement for this year’s Swim Team interest meeting for TOMORROW, Wednesday. 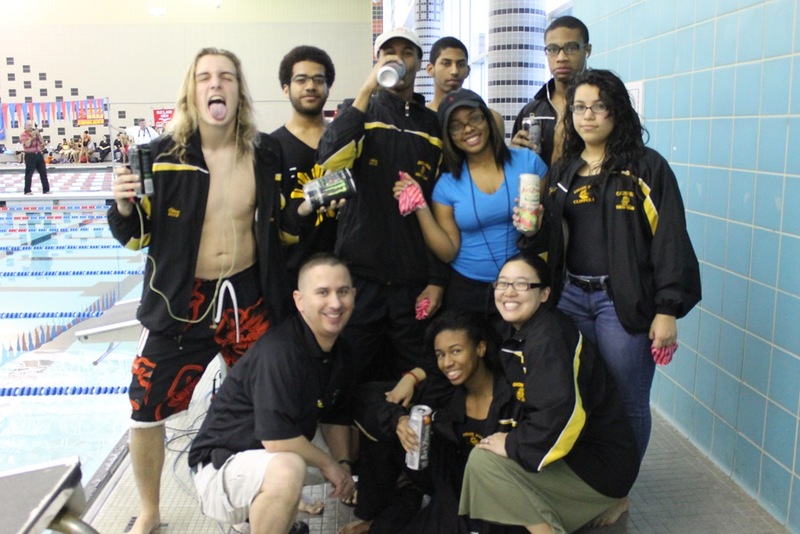 I am a part of this Swim Team. Proud member, slowest member. I think I got sick last year for straining my voice, cheering and yelling so loud. But as my final year on the team, I’m ready to see the new recruits. I wore this jacket around all year! That’s me standing awkwardly on the left, by the way. I got this jacket Sophomore year late in the season, and it was big then as it still is now. In wearing this jacket around school constantly, I’m hoping to raise awareness that Swim Team does exist, and we are happy to meet new members. We welcome them with dripping wet, open arms! These are the seniors that left last year. I’m really devastated to have lost them all. Chase (left, blonde) was the male team Captain and he was also one of the fastest. Michael (afro—remember him from the Italy post? His bush is so much smaller here!) will be dearly missed too. He was fun to have around and he was one of my idols/influences/minor crushes last year. Don’t tell him I said that haha. So remaining on the team are Me, Annabelle, Alondra, Taylor, Aracelly, Kathleen, Ashley, Alex, Todd, Trevor, Tristan, Cockroach, Casey, Avery, Shawn, I can’t remember anymore names…just pretend you know these people, because they’re currently our roster. Maybe. If everyone comes back. If we’re lucky, the incoming meat (fresh meat, as Coach calls them) will double the team. Step Two: Refresh the people who may not come back. Namely: Casey, who also does Football. I don’t talk to him on a regular basis, but we had AP Lang together last year (together implies that we spoke—no, we didn’t, but I kind of wish we did). Yesterday morning while in the cafeteria, burning time, Casey walked in and sat a few spaces down the table from me. Bravely, while everyone was getting up to leave for class, I gathered my courage and asked him if he was coming back to Swim Team. He had the biggest smile. I was too focused on that to pay attention to what he said. I think I caught a maybe somewhere in his smile, but God, he wasn’t playing fair. I wonder what he was thinking when I just gave a nervous smile and kept nodding. 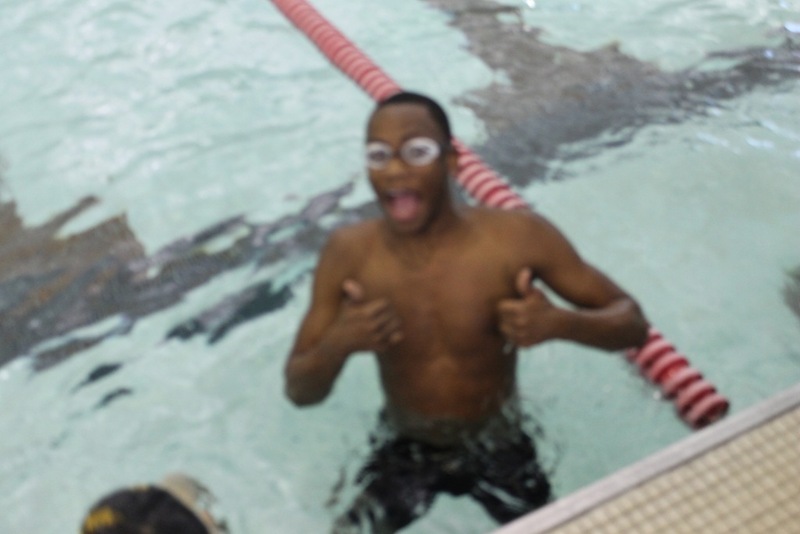 Then I gave him two thumbs up! Something like Shawn is doing right here. God why am I such a dork. Russhope: Ashley has hairy legs! Ashley: Shut up! I do not! Russhope: Her legs are like Chewbacca! Here’s Ashley on the right. But that little exchange had really made my day, so I’m kind of curious now—is Russhope joining the team? I don’t want to get my hopes up, but it’s a little too late for that. Hn. I guess I was deemed “Best Cheerleader Ever” on the team for a reason.